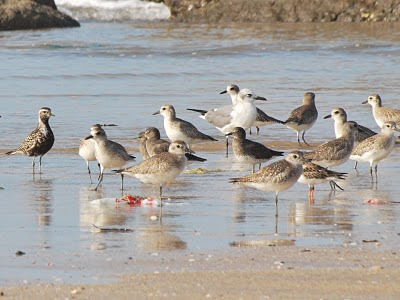 Jan Axel Cubilla posted an account of our golden-plover sighting of last Saturday on his blog. Included are a lot of photos of the bird, both digiscoped and DSLRd, and an analyzed close-up of the rectrice-primary situation, reprinted below for documentation purposes. The most important field mark was the primary projection. 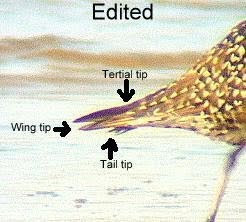 I can see the tip of the longest tertial barely reaching the tail tip, and 3 primary tips projecting from it (maybe 4, confusing because American Golden-Plover is supposed to have at least 4 projecting primary tips, although quite often primaries 9 and 10 are the same size). Also note the tail tip far behind the wing tips (unfortunately, I did not obtain better photos. Both photos were cropped; the edited one was brightened and sharpened). But CAUTION, all these differences can be influenced by molt. Note that this particular bird was molting the tertials and the rectrices, which might affect the perception of the relative relations between the wings and the tail. 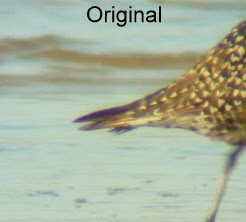 Also note that this particular bird has some marks suggestive of Pacific Golden-Plover (which has never been registered in Panama), like the mostly white vent and undertail cover (also note some white feathers all along the sides and flanks), the contrast between the mostly brown-spotted mantle (or gold-spotted) and the white-spotted wings, and the relation between the longest tertial tip with the tail. As always, any insights you may have as to the identity of this bird are most welcome. Very nice photos and very informative blog. Nicely done. A warm hello from Oman.